Would you like to track down (or trace) where an email that you received came from? This Trace Email tool can help you do precisely that. It works by examining the header that is a part of the emails you receive to find the IP address. If you read the IP Lookup page, you'll get a clear idea of what information an IP address can reveal. If you only have an email address, try InfoTracer's lookup service. If you have the full email headers use the form further down on the page. To find the IP address of a received email you're curious about, open the email and look for the header details. How you find that email's header depends on the email program you use. Do you use Gmail or Yahoo? Hotmail or Outlook? Note: We are in the process of compiling instructions from a variety of popular webmail services and email applications. In the meantime, if you have a question about your email provider, please post it in the Email Tracing Forum. Scroll down below the box for the Trace Email results! You should know that in some instances people send emails with false or "forged" headers, which are common in spam and unwanted or even malicious e-mail. Our Trace Email tool does not and cannot detect forged e-mail. That's why that person forged the header to begin with! Paste the header you've copied in the box. 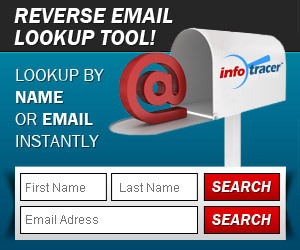 If you only have an email address, try InfoTracer's lookup service.